I recently bought a copy of Harrison's Mixbus DAW, via a sale they are having at DontCrack. Though I already use Reaper as my primary DAW, I was attracted by the potential for Mixbus to put an analog console feel to my mixes, as well as the price point. Some folks have said it's a no-brainer buy, while others touted their own favorite console emulation plugins as better sounding. Seeing as mixing is not my day job and $40 puts Mixbus at one of the cheapest prices for a console emulator plugin (though it is invariably more than that), I decided to dive in and give it a try. Harrison has been around since the 70s, making high end boards for film and audio. Since the digital revolution in recorded audio, they've been transitioning into the digital domain, making their boards with digital controls whilst keeping a good sounding analog frontend. Mixbus is their first step into the DAW world, and while I must say there are some things lacking, they have made the core of their product in line with the sound they've created through their analog consoles. 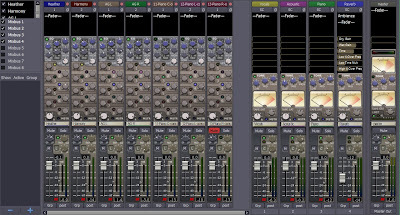 Mixbus's mixer view - looks like a sound board! Mixbus's approach is directly derived from what they've been making for years and years: consoles. The mixer view is designed to look just like a recording console. The idea is to have one knob control a single function, and to have everything you need to make a mix on one screen. Needless to say, a nice wide screen helps if you have a lot of channels! Just like a sound board, there is an EQ and compressor per channel, but there is also room for your favorite plugins to be put in as inserts. Channels can be routed to up to 8 busses, which ultimately combines into the master fader. On each of the busses, as well as the master buss, is tape saturation. Embedded into each of the mixer's features is Harrison's DSP, derived from their own consoles. That means that the EQ, compressor, and tape saturation all have Harrison's trademark sound on them. Harrison's experience in the analog console world has informed them of the optimal settings and configurations of each effect in order to give the maximum benefit with just a few knobs' worth of turning. The EQ is designed to give a broad Q when cutting or boosting very lightly, but once you turn the gain towards an extreme, the results is a thin but deep cut or boost. The compressor has 3 flavors: Leveler, Compressor, or Limiter. Leveler mode is designed for evening out the volume of a channel, for example, normalizing between soft and loud parts of a vocal. The Compressor is your standard compression, and can give a nice strong tone to the channel. Limiter mode is of course a hard compression that tames anything above its threshold coming its way. My plan in buying Mixbus was mostly to use it as a final touch for my mixes. The two reasons for this are because 1) I'm already used to mixing in Reaper, and 2) Mixbus is still short of some features that I would want in a full-time DAW (I'll explain more below). I imagined either routing the outputs of my busses from Reaper into Mixbus, or exporting stems from my mix into Mixbus for the tone it gives. I haven't gotten to try out routing straight from Reaper into Mixbus yet (also explained below), but I have had the chance to put an almost-finished mix's stems into Mixbus and compare the tonal differences. I'll leave it to you to be the final judge, but I hear two big things. One is that there is a nicer bottom end, which comes out in the guitar's lower notes as well as thickening up Heather's lower notes. Secondly and my favorite so far is that the high end is tamed much better than I could do with EQ; parts where Heather strains a bit while she goes high, no longer sound piercing, but rather has a smoothness to it. While I could only hear the difference subtly on my monitors and headphones, the real kicker is when I played it in my car; yep, I gave it the old car stereo test. My car speakers are like NS-10s in that whatever tiny bit of a mix sounds bad, the speakers make it sound worse. So any screechiness that I didn't catch at home, is now someone yelling ear-piercingly into my ear when I'm in the car. Mixbus did me the favor of taking all (well, most) of that away, as well as not making my mix sound too boomy (which tends to happen in the car). Those two features alone made it worth the buy, and I'm barely at 24 hours of owning it! But nothing's perfect in the world...which is why mixing, even though it's a fun passion of mine, is sometimes still a lot of work. There are a few things that I wish Mixbus had that Harrison has not yet developed into their software. The biggest is that I can't wire my Reaper stems into Mixbus for direct playback (using something called MIDI Machine Code or MIDI Time Code). The feature unfortunately is not yet available in Windows, though if you run OSX or Linux, you can do this. On the Mixbus website they claim that it is a feature coming soon, so I will hold my hopes high; in the meantime, it looks like I'll be exporting finished stems into Mixbus to give it that final sheen. Lastly, you'll read as well that not every VST plugin works on Mixbus, nor does every AU work for Mixbus on Mac. There is quite a bit of programming work to be done, but now that Mixbus is getting more attention, my hope is that they will roll out updates with fixes sooner than later. So I gotta say I love Mixbus so far, and for the price it is right now, it's a great addition any budget-conscious mixer's bag of gadgets. It gives me that analog sheen without much effort, and it makes me excited for the step up in sound I'm not able to produce. 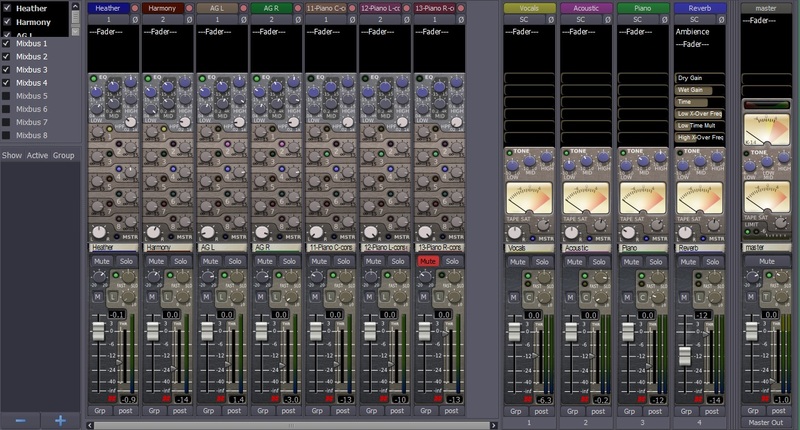 If you bought or have used Mixbus, what were your first impressions?